The article below featured in the Geelong Advertiser on Saturday June 20, 2015. 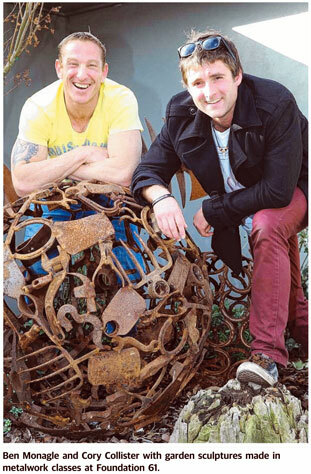 It appears here courtesy of Mandy Squires and the Geelong Advertiser. ROB Lytzki knows a bad road when he sees it — he spent three decades travelling one. 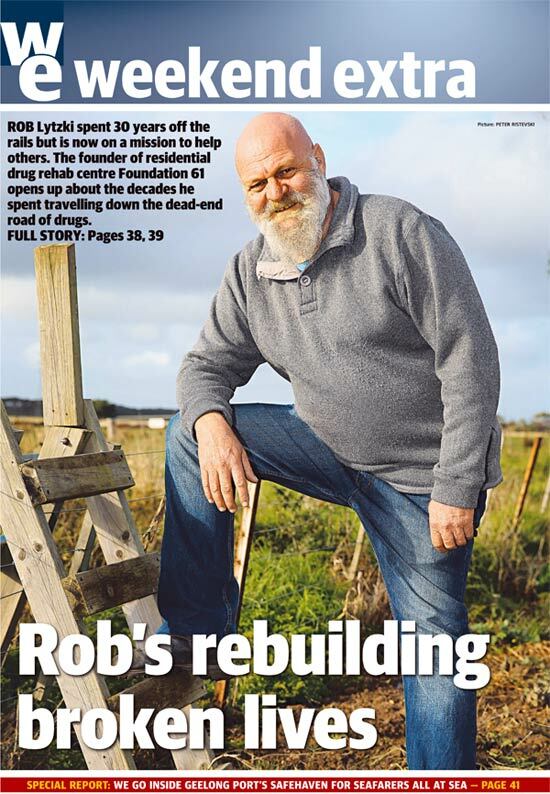 The founder and director of not-for-profit residential drug rehab centre Foundation 61, at Mt Duneed, Rob makes a point of sharing his life experiences in a bid to help others. "I spent 30 years pissed and stoned, never facing myself and watching people die, get raped and go to jail," he said. "At the end of my road, when I couldn’t take any more and suicide seemed like the only option, I found a way out and that way was to talk to someone who cared and listened. 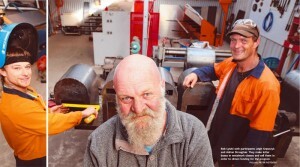 “Speaking at a youth ice summit in Geelong on Tuesday, the quietly spoken counsellor had a roomful of 16 and 17-year-old Gordon TAFE VCAL students and trade school apprentices hanging off his every word. Rob told them he was "no dummy", and knew there were kids in the auditorium who had used ice. He asked them to picture their family members grief-stricken at their funerals. And to protect their friends, rather than their friendships. Rob said he once attended five suicide and drug overdose funerals of young people in a row. Young people — such as the building industry and hairdressing apprentices at the GTEC summit — who might have gone on to become mothers and fathers, build successful businesses and lead fulfilling lives if they hadn’t started “on the drugs road”. "I deal with hundreds of people whose lives are shattered by drugs and I see the tragedy of burying a young person. I look around the grave sites at all the family members, the people who tried to love these guys — their brothers, sisters, mothers and grannies — all destroyed because they are burying someone before their time. Because they’re burying someone who shouldn’t be dead. Because they’re burying someone who was worth a lot more than that," Rob said. "Talking and truth" were essential to healing the wounds which fostered addiction, he said. At Foundation 61, people were encouraged to be honest and open up about the painful things which had happened in their lives. It was not until he finally started talking, at 40, about the abuse he had suffered as a teenager, that the maelstrom of alcoholism and drug addiction slowed, and eventually stopped, Rob said. In the years between, he made denial, drugs and grog his constant companions, "wrecking a couple of good marriages and just about everyone else around" in the process. “I wasn’t at peace and I wasn’t looking at myself,” he said. “If you start in life in bulldust, and masquerading to everyone around you that you’re going OK, that you’re cool, that ‘you’re the man’ or ‘you’re the woman’, you’ll start to live that lie, but it will take a lot of tranquillising to hold on to the lie over time. The drugs will get stronger, the alcohol use will grow and the pain and shame and blaming will build up and you’ll start to hurt more on the inside. Rob said he had seen many drugs do damage over the years, but nothing as addictive and destructive as ice. About 90 per cent of inquiries and admissions to Foundation 61 were now ice-related, Rob told the Geelong Advertiser. Three years ago that figure was 50 per cent. Demand for places at the centre could not be met and there was now a significant waiting period for treatment, he said. Tragically, young people were dying on the waiting list, Rob said. But Foundation 61, which offers long-term rehabilitation, was unable to make three of its 15 possible rehab beds available because of lack of funding, he said. Another $80,000 a year was needed to operate the facility at full capacity, Rob said. Foundation 61 was also trying to raise $1.5 million to build and operate a new 10-bed women’s drug rehab centre, he said. Supported by Give Where You Live, Percy Baxter Trust, churches, charitable organisations and private donations, Foundation 61 had treated hundreds of people over the past 10 years, Rob said. Addicts were asked to commit to at least six months at the Mt Duneed residential facility, after which they had the option of moving to a transitional house in Geelong. People paid 75 per cent of their welfare benefit to stay at Foundation 61, which was supported by dedicated staff and volunteers, Rob said. He told teenagers at the youth summit he hoped they never went so far down the ice road they needed to stay at Foundation 61. "Don’t even start on the road that will destroy you and destroy others in your wake," Rob said. He said he hoped they all had "real friends", who would "step up and step in" if they did lose their way. "I’ve noticed in life that most young people tend to protect their friendship rather than their friend," he said. "They stand back and watch their friend slowly sinking, going down the road of drugs and alcohol, and they say nothing because they want to keep the friendship. "But remember this, when that friend dies there is no friend and there is no friendship. There is only pain. So don’t protect your friendship, protect your friend." Donations to Foundation 61 can be made here.